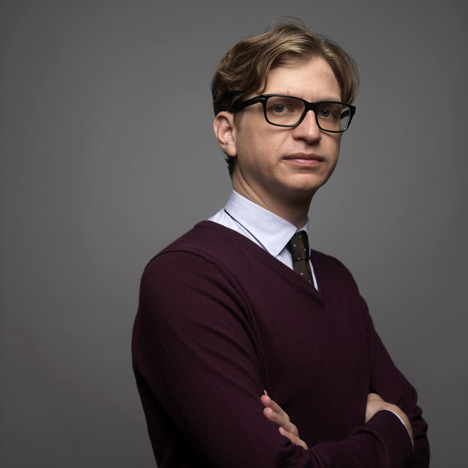 News: journalist Kieran Long has been appointed senior curator of contemporary architecture, design and digital at the V&A museum in London. Long, who is the architecture critic for UK newspaper the Evening Standard and was also assistant director to David Chipperfield at the 2012 Venice Architecture Biennale, will take up the post at the V&A museum in the new year. The role is one four new positions at the world's largest museum of art and design and was created as part of a move to bring together the fields of architecture, design and digital within the existing department of furniture, fashion and textiles, currently led by Christopher Wilk. "I want to make exhibitions that take seriously popular engagement with the three fields, as well as making the V&A a place of discourse," said Long on Twitter this morning. Speaking to Dezeen today, Long expanded on this. "The idea is not to be bound by disciplinary boundaries, but reflect people’s engagement with architecture, design and digital through popular culture and their daily lives," he said. He also described how he wants to use the position to "wage war on parochialism" in design. "There is a tendency in London architecture and design to see London practice as the acme, but there are places in the world where more urgent problems are being tackled in more interesting ways," he said. "I want my work to always have a base here, but reach far beyond in the way a world museum should." Long is one of several journalists that have moved into curating. This year Domus editor Joseph Grima organised exhibitions at the inaugural Istanbul Design Biennial and the Salone Internazionale del Mobile in Milan, while ex-Monocle journalist Dan Hill has recently taken up a position at creative laboratory Fabrica. Recent exhibitions and installations at the V&A include chairs that mimic their surroundings, a huge prism with data on each of its facets and a series of coloured drips that fall down through six storeys. In terms of exhibitions, I think the idea is not to be bound by disciplinary boundaries, but reflect people's engagement with architecture, design and digital through popular culture and their daily lives. I'm inspired by themes that resonate with the V&A's collection and with mainstream culture, and I think intellectual rigour is entirely compatible with popular engagement. I think all my work recently has been about dealing with large audiences but trying communicate original ideas in ways that make sense to people's lives. As for collecting, the V&A already collects huge amounts in contemporary design, architecture and digital right across the museum. Our challenge will be to understand what contemporary objects and projects the V&A should be collecting and how we give the museum strengths in particular fields of contemporary practice. For instance, what are the boundaries of product design today? I think it gets interesting when you look more broadly than just at 'what designers do' and understand design as a field that can be professionalised, but can also be informal, popular, participatory and so on. I think one certain desire is to wage war on parochialism. There is a tendency in London architecture and design to see London practice as the acme, but there are places in the world where more urgent problems are being tackled in more interesting ways. I want my work to always have a base here, but reach far beyond in the way a world museum should. I haven't even started yet, so these are first thoughts and I have a lot to learn. The future of the team will also be defined by the other curators who will work for and with me, and I'm very much looking forward to that conversation.